I will always remember the moment that my train from Zurich shot out of a tunnel under the Swiss Alps and Lake Geneva “emerged in all its glory,” said Joanne DiBona in The San Diego Union-Tribune. 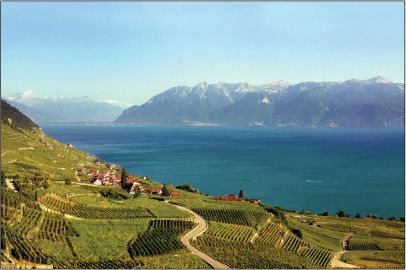 Azure water sparkled under jagged peaks as the train skirted the crescent-shaped lake, rolling past farmhouses, medieval towers, grand chalets, and terraced vineyards that “cascaded down steep slopes” to the shoreline. I instantly understood why so many writers, artists, and actors— Graham Greene, Charlie Chaplin, Audrey Hepburn—have made this region their home. My destination was the lakeside town of Vevey, where I arrived just in time for dinner. At an open-air restaurant beside the main promenade, I ate delicate fresh lake perch paired with an “outstanding” local white wine.